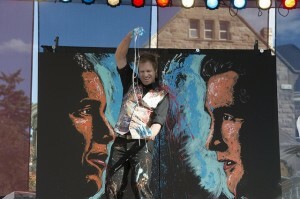 Brian Olsen of Art in Action creates art foreshadowing the presidential debate at the University of Denver. Photo courtesy University of Denver. Tonight’s presidential debate brings both President Barack Obama and Governor Mitt Romney to Denver. But it’s hardly the first time the two candidates have made the rounds of the Centennial State. With poll numbers tight between the two candidates, Colorado has emerged as a key battleground state. Obama seems to be leading here, but strategists say the state may be even more important for Romney. From Washington DC, David Frey reports. It’s become a familiar sound in Colorado recently. Presidential campaign rallies…President Barack Obama at a Colorado State University appearance and Governor Mitt Romney last summer in Aurora. Both candidates have made numerous stops in Colorado. Including a visit by Romney to Basalt High School, they’ve stumped in towns from the Western Slope to the Eastern Plains. The choice of Denver as the site for the first debate is only the latest example of how important Colorado has become for both candidates. It might be the only thing the two men agree on. Senator Mark Udall is a Democrat. He supports President Obama, but he sees why both candidates are courting Coloradans. With a tight race nationwide and an apparently close race in Colorado this time, the state’s nine electoral votes have become particularly important. Political strategists talk about roads to the White House. Both campaigns have mapped winning based on roads that go through Colorado. Recent polls show the President has opened a narrow lead in Colorado. That worries Governor Romney’s supporters. They say winning the state may be even more important for him than it is for Mr. Obama. That’s because the President now also appears to be leading in Florida and Ohio, a state that historically has been crucial to winning presidential elections. Conservative strategist Alfonso Aguilar in a recent appearance at Georgetown University in Washington, DC., said without Ohio, Romney is in trouble. Aguilar directs the Latino Partnership for Conservative Principles. He says Mr. Romney still has a chance in Colorado, but could be hurt among Latino voters by his tough rhetoric on immigration, especially during the primaries. Democratic strategist Maria Cardona, told a Georgetown audience that the Latino vote will be key, not just in Colorado, but in other swing states, like Nevada and Florida. Both candidates have been making the rounds in Colorado, appealing to voters in big cities, small towns and suburbs. For Coloradans, that means lots of chances to see their candidate up close, or listen to both of them before they make up their minds. … And for many, it means lots of unwanted attack ads, junk mail and robocalls until Election Day. 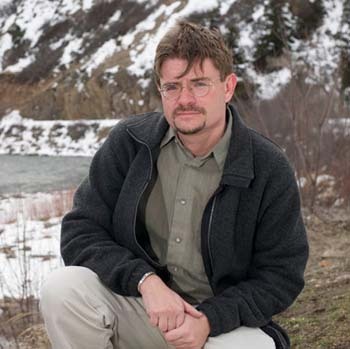 For Aspen Public Radio News in Washington, DC, I’m David Frey.